I was hurting. 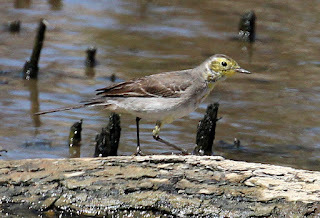 There was a Citrine Wagtail at the Whyalla Wetlands and I hadn't seen it. Of course I was delighted to see the Tufted Duck at Werribee on 3 January. Of course I was. But the duck's presence did not make up for the wagtail's absence. Citrine Wagtails have turned up in Australia before. Notably, in my memory, one turned up in Mudgee in New South Wales in September 2014, when I did not see it. I visited the Putta Bucca wetlands in Mudgee on 10 October 2014 and the bird had flown. So I particularly wanted to see this bird in South Australia in 2019. But I did not want to travel to Whyalla alone. I emailed everyone I could think of: did they know anyone who'd like to twitch the wagtail with me? No one did. In desperation, I put a note on Birding Aus. This paid off immediately. Ken Haines phoned. Ken is a bird photographer I'd met while boneseeding at the You Yangs. He takes great photos which he has contributed generously to my last book (Best 100 Birdwatching Sites in Australia) as well as my forthcoming book (Birding Australia's Islands). Ken said we could drive to Whyalla, leaving on Monday and returning on Wednesday. It sounded good to me. And that's what we did. Ken picked me up at 4.45 a.m. on Monday and we drove directly to Whyalla, arriving at 5.15 p.m. We went straight to the wetlands. We knew which pond the wagtail had been seen in and we stood at the edge expectantly. There were over a hundred Black-tailed Nativehens. There were avocets, stilts and sandpipers. There were ducks, both domestic and wild. There were grebes and cormorants and dotterels. But there was no wagtail. We walked around the pond. We searched every muddy inch of the water's edge. There was an island in the centre of the pond, where Silver Gulls were roosting, but it did not look particularly inviting. We looked, we waited, we walked around. We began to feel that we'd driven 1100 kilometres for nothing. Neither of us dared to articulate our fears. The light began to fade, but we persisted. And, at 6.25 we were rewarded! The wagtail appeared. It was very active and very obvious. I don't believe we could have missed it, had it been present for the previous hour and ten minutes. I believe it was hidden in the vegetation, perhaps amongst the reeds, perhaps under the bushes. I was delighted, of course. As far as I was concerned, it was mission accomplished. But a photographer requires photos. Ken had lovely shots of Wood Sandpipers, but that wasn't what we'd come for. So we returned on Tuesday morning at 6.15. The scenario was much as the day before. Lots of waterbirds, but no wagtail. We'd talked of reassessing the situation at noon. I feared we'd be there all day. If the wagtail didn't appear again until 6.25 p.m., when the light was not optimum for photos, would we have to stay another night in Whyalla? We walked around the pond, again neither of us daring to say what we were thinking. The hours ticked by and there was still no wagtail. What was a little surprising was that there were no other birders there either. We were the only people looking for the wagtail. Lots of joggers and dog walkers passed by, but no birders. Then, just as suddenly as it had yesterday evening, at 11 a.m. the bird appeared! Not only did it put in an appearance, it was coming towards us! It wanted its photo taken. 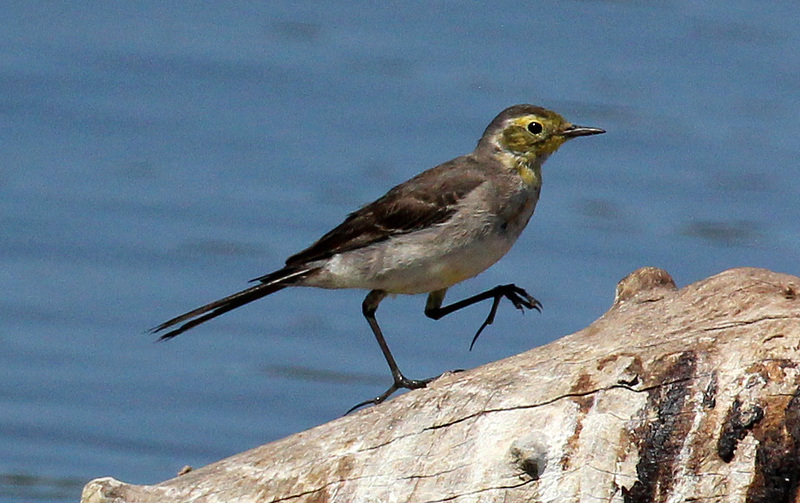 It hopped onto a dead tree in the water and made its way along the log, in jerky wagtail fashion. At the end of the log, it stopped to preen and give us a good look. Not that Ken was looking. He was too busy taking photos to enjoy the spectacle. His camera was clicking away with excited machine-gun repetition. That's the story really. Ken got his photos and I got my bird. We drove home in a leisurely fashion, each of us feeling that we'd just achieved something special. And we had. We'd driven 1100 kilometres to see a vagrant wagtail. And a very beautiful wagtail it was. Thank you, Ken.